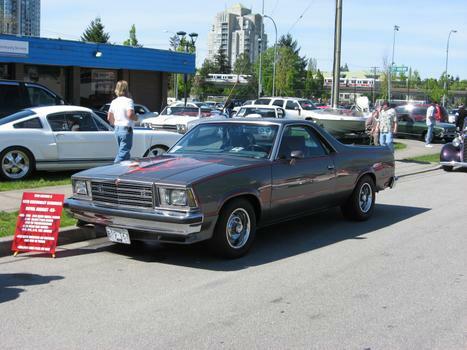 This is my '79 Chevrolet ElCamino Royal Knight -SS- . I have owned this car since 1982, and has 491,000 km's on it. It also ran on natural gas for 23 years, but I had to change it back to gasoline to get the Collector Plates. This car is as rare as hen's teeth, I know of only one other in the whole lower mainland of Vancouver, BC. Never seen or even heard of one before. THUMBS UP !!! 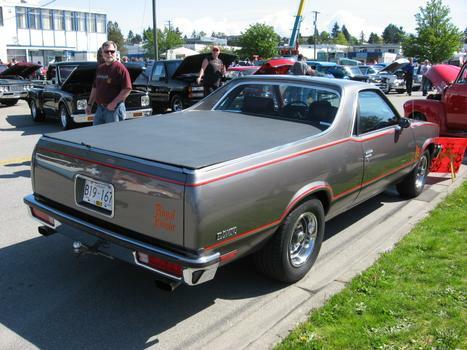 My Elcamino was build in Fremont, California . 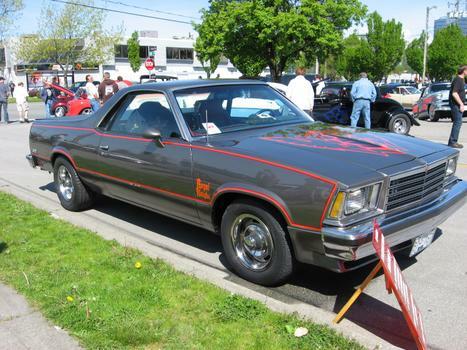 In 1978 Chevrolet build a Black Knight, which was decalled the same , only in Black, I believe . From 1979 to 1983 they build the Royal Knight, in various colours , Mine was black orginally , but that is such a hard colour to keep clean , so I painted it the colour you see it today. 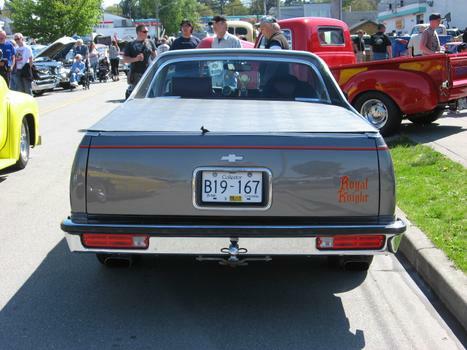 The hood decal alone was about $350.,from GM, so most Black or Royal Knights disappered as owners repainted there Elcamino's. GMC also build a Diablo [the Devil] back in those years. GM just wanted to jazz up there cars to help sales , just like the Firebird with all there decals . If you GOOGLE Royal Knight you will find the decal company who makes these decals and lots of others . Don . my next door neighbor had one. I always liked hearing and seeing it run up and down the street. He had to sell it when he was put in a nursing home and I still see it rolling around in the area. I always thought he put the royal knight and firebird decal on it himself. amazing to see one running around in gray instead of the sun-bleached maroon of my neighbor's. awesome car!! Thank-you for your comment . This car was black when new , but that colour is sooo hard to keep clean . This car ran on natural gas for 24 years and has about 496,000 km's or 308,000 miles on it .